As the saying goes, behind every successful man, is an equally successful and supportive woman. The same can be said about Grab. 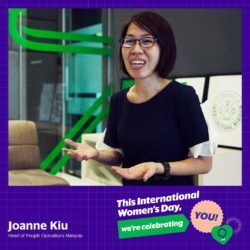 Whilst the general misconception is that as a tech-based company, it appeals more to the male workforce, however, behind Malaysia and Southeast Asia’s leading ride hailing and payments platform, there are a number of amazing women who are blazing the trail and pressing for progress to move the company to greater heights. 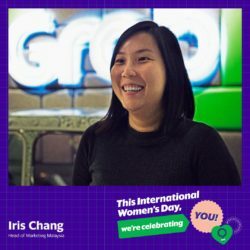 So, in conjunction with the recent International Women’s Day, for the month of March, we are celebrating some of the many inspiring women who are driving Grab – behind the wheel or different engines within Grab Malaysia! I came to know about Grab when I had to use the MyTeksi service to book a ride. I had a very insightful conversation with my driver and that stirred up my interest in the company and what they were committed to do. When I joined, the company had just introduced the GrabCar service; it was still at its infancy and growing fast, therefore the learning curve was steep. I had to figure out how to break into a market where there was limited consumer understanding, research or analytics as reference. Together with my team, we had to hit the ground running to understand our passengers and driver-partners needs and behaviour. But coming from a Process Management background with experience from various multinational companies, it helped me encourage my team to think through our challenges and the problems we were trying to solve, and thus, how we can execute our campaigns effectively. What encourages me daily is seeing how different departments can come together with a single-minded purpose to make magic happen, without any personal or hidden agenda. Everyone, regardless of roles, gender, age or country we are from have equal opportunity to share our opinions and ideas, and learn from each other. It is because of this, I have not only grown professionally, but have also fostered many meaningful friendships. We not only enjoy working together but we also destress and have a lot of fun together, be it over food and drinks, exercise, or just the occasional silly jokes and office banter. I was working in Singapore for about eight years, then after having my first child, I decided to come back to Malaysia. Having a background in customer service, I was hired to manage the customer service centre in MyTeksi. That was in 2013, and I had only 4 agents. Today, I now have 150 agents under my wings, and it’s a task I do not take lightly. They motivate me every day to be a better leader. As the lead on Customer Experience for Malaysia, my team manages incoming calls, social media postings and email correspondences from both driver-partners and customers. Being in the service industry, it’s not always easy and sometimes we have very tough days, but they come to work every day trying hard to outserve our driver-partners and customers. As they say, behind every successful man is a woman supporting him, but in my case, that person is my husband. He understands the demands of my job and is continuously encouraging me to embrace the challenges and focus on growing my career. His patience and understanding has enabled me to give my best to my job. However, on the flip side, my colleagues and team members have also been understanding and respectful when I take time off for my family. There are an increasing number of women in Grab who are balancing their work and families, and I am grateful that Grab makes it easy for us to enjoy the best of both worlds. Joining Grab was not really something I planned, it was pure luck. My role is to oversee safety primarily relating to our passengers and drivers. I need to review, analyse and seek to understand the root cause of the issues such as speeding and accidents, and following that, work with different departments to mitigate them. Coming from an Oil & Gas industry which is primarily dominated by men, it was quite daunting. But I’ve learnt that if there’s one thing that sets us as women apart from men is the “human touch.” This is a natural talent we have, coupled with that element of empathy I think we as women exude, and it is one that I have greatly relied on especially when I need to reach out and support our passengers and drivers-partners when their safety has been compromised for whatever reason. Despite I work with a team which comprises mainly of men, they treat me as an equal and we value each one’s opinion and what we can all bring to the table to make Grab a safe platform for everyone. 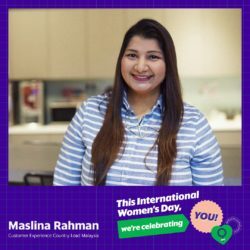 If there is one thing I can share with other fellow women in my similar position is that we shouldn’t feel insecure or undermine our abilities. We should never feel like our voices do not matter, especially if we believe strongly that something is right. And never be afraid to stretch our boundaries! I was first approached by a head-hunter in 2013 to join Grab, then known as MyTeksi. 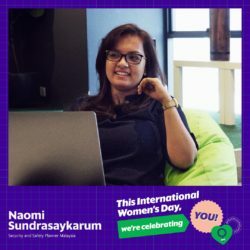 Initially, I was quite uncertain, but I was appealed by the opportunity to be a part of something that would help make women feel safer when riding in a taxi in Malaysia. It was a sense of purpose that resonated with me and I wanted to be a part of it. Joining Grab has been one of my most challenging yet rewarding decision by far. The things we have accomplished and made possible never ceases to amaze me. I still recall the early days – We were constantly being challenged – from finding the right talent and fit to how we can improve ourselves to better serve the company. When I joined, we only had 30 employees and many of our processes like claims and salary were done manually. Today, I am speechless just seeing how we have scaled and blossomed. We now have more than 600 over employees in Malaysia, our systems are so much more advanced now and how we are taking Southeast Asia by storm! We are constantly being stretched to go beyond our boundaries and the knowledge and experience I have gained here is priceless. It’s also very humbling that regardless of how experienced one may be, we are all ready to band together to learn and grow. I hope, my own children – who are my driving force – will one day be able to have such a fulfilling experience in their working life. Click here for Vol 2.